Wednesday July 3rd 2013 @ Ashwood Park Primary School, Stourbridge. 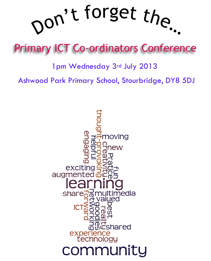 As usual the ICT conference will feature lots of exciting ideas and different themes. It is a great opportunity to network and share experiences. Following J2E’s presentation at the autumn conference, Serif Software will be continuing the creativity theme.